The plaque reads: Rosalyn House - Built adjacent to 131 High Street known as ‘The White House’’ once owned by Josiah Freeman, the last mill owner in Houghton Regis. 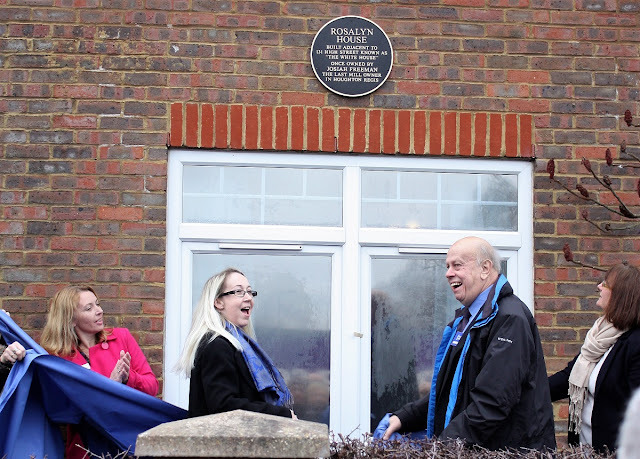 A special plaque was unveiled this afternoon in Whitehouse Close. Around 60 people attended to witness the plaque being revealed on the side of Roslyn House. 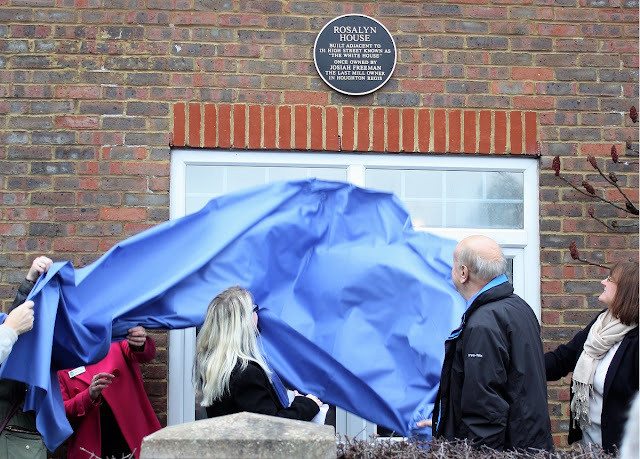 Hailed as the first of its kind in the town to celebrate Houghton's rich history, it reminds people of Josiah Freeman, who owned two mills in the town, and lived in the White House, which was on a site close to where Roslyn House is now. 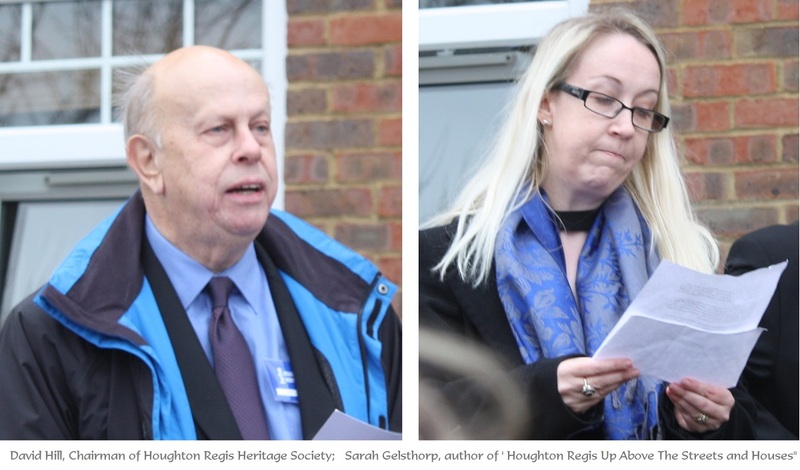 Attending the event were Sarah Gelsthorp, author of 'Houghton Regis Up Above The Streets and Houses', David Hill the Houghton Regis Heritage Society chairman, local councillors, and representatives from local community groups, as well as some residents of Roslyn House. Following the unveiling, light refreshments were served at All Saints Parish Church, and copies of 'Up Above The Streets and Houses' were on sale, along with a book by Houghton Regis Heritage Society about the History of All Saints. The plaque was purchased with a third of the funds raised so far, from the sale of the book 'Houghton Regis Up Above The Streets and Houses’. The plaque project is a joint initiative, in partnership with, Houghton Regis Heritage Society. The other two thirds of the funds has been donated to the Heritage Society directly. Sarah's book has sold throughout the UK; as far as Scotland, and been sold internationally to parts of America, Canada, New Zealand and Australia. 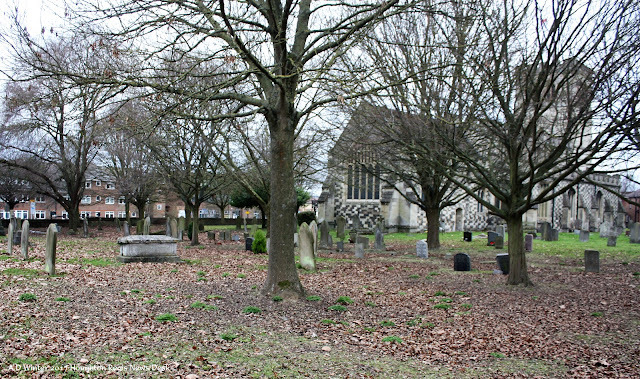 Josiah Freeman's last resting place is thought to be in the closed cemetery at All Saints Church. Josiah was related through marriage to Hollywood film star Gary Cooper. The family owned a windmill and later a steam mill behind Mill Lane, Houghton Regis.